How Do Sea Monkeys "Come To Life?" Sea Monkey kits were a popular mail order novelty when I was a kid. When seen in a comic book who could resist bugging their mom or dad for a few bucks to own these little creatures which were portrayed as tiny monkey like creatures with fins and large smiles. Unfortunately the comic book portrayals were far from the truth and to make matters worse, a thousand sea monkeys could be reduced to one in a very short time, unless they were cared for properly. I can remember the disappointment. So I'm sure you are asking, what are Sea Monkeys and how are they brought to life? "Invented" in the 1950's (specifically, 1957 by Harold Von Braunhut, the creator of "X-Ray Specs" nonetheless) Sea Monkeys aren't monkeys and neither do they live in the sea! Sea-Monkeys are a hybrid breed of brine shrimp called Artemia NYOS. Marketed as "Instant Life," these novelty pets were an instant success and they're still popular to this day! In times of adverse environmental conditions some crustaceans enter a state of suspended animation where they can remain indefinitely or until conditions improve. This is called "cryptobiosis" and it's a Sea Monkey's greatest trait! When you open your Sea Monkey kit, you'll find what appears to be lifeless dust, but in essence, you'll be looking at brine shrimp eggs. Add the sea salt chemical packet to some water and the "Sea-Monkeys" will spring to life! Over the next few weeks they'll steadily grow as you feed them yeast and spirulina (a blue-green algae that can be consumed by humans and other animals.) Spirulina eventually forms in the tank if all goes to plan at this juncture of your Sea Monkey adventure. Even if Sea-Monkeys do not resemble the creatures in the ad, they're still remarkable little creatures, especially for a child. Sea-Monkeys are born with one eye but upon reaching maturity they suddenly have two additional eyes! Creepy for a human; normal for a Sea Monkey. They're also translucent, they breathe through their feet and they can reproduce sexually or asexually. Brine shrimp always have existed in nature but they've never been marketed and sold as pets. Enter Harold Von Braunhut, a scientist who "invented" these pets but didn't actually create them! Von Braunhut discovered that these brine shrimp eggs had a very long shelf life outside of water. In 1960 he began selling brine shrimp under the Sea-Monkey name through mail order. The marketing was targeted toward children who read comic books and the Sea-Monkeys were advertised as almost anthropomorphic creatures that would instantly spring to life when they were introduced to water. 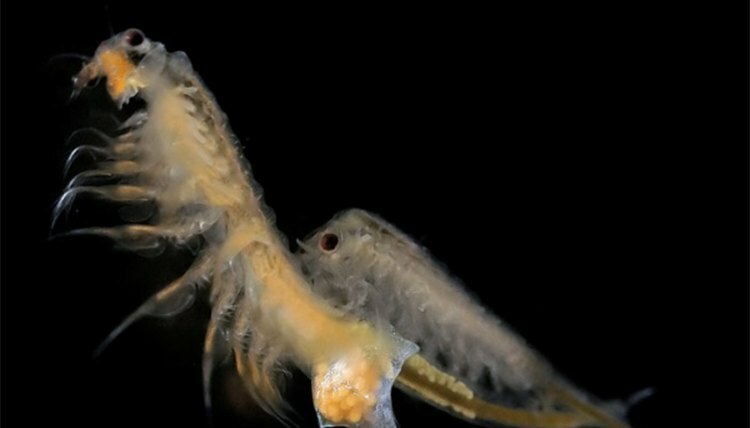 Brine shrimp have a unique birthing process; they produce eggs called cysts which can survive long periods of time (up to 25 years) in the right conditions. In the Sea-Monkey kit the eggs are packaged in a chemical compound Von Braunhut called "Instant-Life Crystals," which helped preserve the eggs in the kit, thus making them last longer. This made these Sea-Monkey's even more mysterious. Under the correct conditions Sea-Monkeys can grow rapidly. They have more than a dozen life stages where they'll molt between each stage. With warm temperatures, well oxygenated water and enough food they'll grow to adulthood in a little over a week. With less attention it will take at least six weeks. A Brine Shrimp doesn't have a brain but has a collection of nerves that tell him what bodily function he should be doing at any given time. He breathes through his feathery like feet and eats algae, which is when you can see him best (after a meal) because he is mostly transparent so you'll see food passing through him. A brine shrimps anatomy is not as advanced as other pets. Mom.me Animals: Are Sea Monkeys Real Animals?